Tag Archive for "Mobile Tag Team" | Virtual Cloud Software for Salons and Spas. Tag Archives: "Mobile Tag Team"
Social Media is everything. The amount of users on social media would make the third largest country in the world. It’s the #1 reason people go on the web, and it is vital for your business to succeed. Virtual Cloud Software for Spas and Salons tames that beast to communicate with relevant information based on what’s happening in your salon this instant. AIM (all in-one messaging) is connected in Virtual Cloud Software and is an industry first! No need for multiple vendors for one solution. Released in 2013, VCS opens incredible opportunities to target strategically, the key to social media marketing success. AIM stands by to send the messages any way you like whether text, email, face book or twitter. Tweet out new editions to the salon’s decor and furniture or special deals you're having that day. Send text confirmations to confirm client appointments on their phones. AIM's face book and twitter widget is handy because you can update your marketing from one spot on the AIM Console. It's easy to navigate and comes with video training for every function and there are many. “Great opportunities to fill our books tomorrow! "I met with my staff and we decided that 80% of a sale is better than 0% of nothing", an owner was heard to say. VCS targets the clients of service providers that have those openings and pulls the list. Two buttons. Compose a text in seconds. “Lindsey has a cancellation at 2:00 tomorrow! Book online by midnight and receive 20% off your service”. Another AIM ROI. From your AIM console, send a “thank you new client” with a QR code that lands on a three question survey on face book. Send a promotion for an expensive new product and choose those who spent the most money last year for your targeted list. Use Profitable Points and promote double points on a slow day. Do a referral campaign to your best clients and build a strong customer base. Discover young hang outs and offer points and 20% off their first service. Track as many as 200 individual promotions and the retention results on VCS. VCS and AIM bring Team together to track which social media outreach efforts are working. AIM knows how many opened and VCS knows who came in from the promotion, VCS knows how much more they spent, and who was retained by Team Member for each promotion. Tailor your efforts based on what works and try new campaigns based on what you need to happen today. 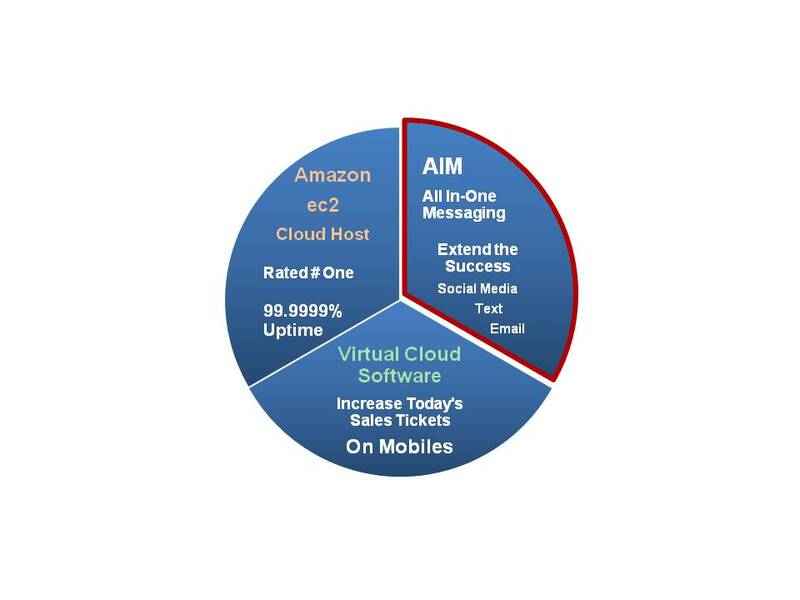 Partner with VCS and AIM's all in one approach using superior apps and messaging on the Cloud. Since you may not have the time, we'll do it for you! Ask about our Concierge Services. Plug into Amazon ec2 host with VCS and AIM and watch your revenue grow!